Evald Karlsten relates that the Royal Swedish Air Force also ordered a surveying type camera with a considerably larger photo format than earlier models, an 18 by 24 cm (7 by 9 inches) format. 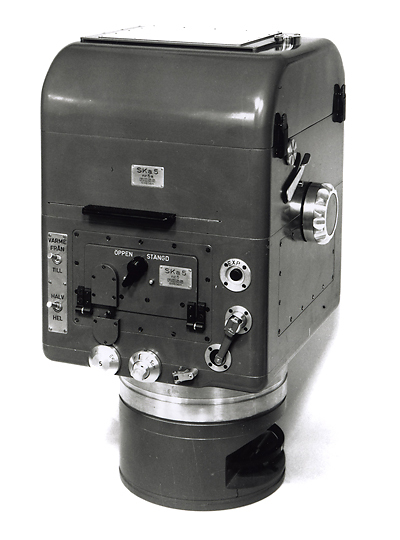 Victor and his men did design and manufacture the SKa 5 aerial camera with a photo format of 18 by 24 cm. A surveying or photogrammetric camera is a precision instrument that has to be carefully designed and assembled such that the photo frame changes little with temperature variations and the focal length remains constant. The lens must be sharp and rectilinear. The lens can be normal, telephoto or wide angle. Lenses for photogrammetry are typically tested in a lab environment to make sure that the center of curvature of all lens elements are on a common center line. The centerline of the lens must be absolutely perpendicular to the film plane. Victor and his crew may have tested in just such a manner. During the period of manufacture photogrammetry worthy wide angle lenses would have been the Topogon, by Zeiss in Germany, the Metrogon, by Bausch and Lomb in USA, and the Pleon, by Zeiss in Germany. These were the best available but they still caused some distortion. The Topogon and Metrogon, which had a 70 degree angle of view, were introduced in 1932. They replaced the earlier unsymmetrical aerial lens Orthometer, that had been designed by Zeiss' Willy Merté in 1926. The use of the earlier Orthometer on the SKa 5 suggests that it may have been more readily available then the later, improved lenses. Normal or mildly telephoto lenses that were available that could have been adequate for battlefield and road building mapping were Zeiss Tessars and Tele-Tessars. The specifications for a mapping camera are not quite as demanding as for a photogrammetric specimen. Even a mapping camera would have required much closer attention to parts casting dimensions. We are dealing with a precision instrument, and much greater manufacturing care must be exercised than in the manufacture of oblique or vertical reconnaissance cameras. Assembly of a mapping camera would have also required great care with constant checking for fit and alignment. Quality control is of utmost importance in successful manufacture of precision equipment. Since only 24 SKa 5 cameras were built it is possible that the Ross Shop did indeed assemble cameras worthy of being called mapping cameras and some may have been at a level that they could qualify as surveying or photogrammetric cameras. So was the Ross Company successful in fabricating a camera worthy of being called a photogrammetric apparatus or at least a “mapping” camera? I don’t know. What is even more interesting is that even if I was holding one in my hands at this very moment I could not say. It would require many precision measurements of the camera body and an optical lab to test the lens alignment and perpendicularity to film plane. I do not have the instrumentation nor do I have the requisite skills. Victor Hasselblad did successfully manufacture cameras of photogrammetric grade at a later time. Actually the earliest Supreme Wide-Angle cameras with rectilinear 38mm Biogon lenses can qualify as a precision instrument capable of survey quality photographs. They certainly qualify as precision architecture picture lenses. Later special cameras and lenses became available for special applications (Lunar Surface Photographs) at NASA and for commercial aerial mapping. NASA initially were going to use the Super Wide cameras with 38mm Biogon lenses for Lunar surface mapping but jettisoned the idea because the consensus was that astronauts ought to be relieved of as many camera operations as possible. The EL and EL/M electric cameras were dependable and had already been reconfigured such that all internal plastic parts had been replaced with metals. The decision was made to use modified EL/M cameras (called Electric Data Cameras or EDC) and add quality, distortion free rectilinear lenses. Carl Zeiss were asked to design and build a wide-angle lens and a near normal focal length lens for the EL/M body. Zeiss designed and built a 60mm f/5.6 Biogon wide-angle lens with 63 degree angle of coverage on the diagonal, with a back focus length appropriate for the EL/M camera. The 63-degree angle of coverage compares to a 90-degree angle of coverage for the 38 mm f/4.5 Biogon. They also designed and built a precision near distortion free 100mm f/3.5 Planar lens for both NASA and commercial use on photogrammetric cameras (MK 70). These photogrammetric quality lenses were individually fitted to their camera bodies and were engraved with camera body serial numbers. All these photogrammetric quality cameras had Reseau plates. Camera with back and 25 cm lens: 24.6 kg. Camera with back and 50 cm lens: 29.6 kg. Airplane mounting bracket: 8.1 kg. Wood carry case, camera with 16.5 cm lens and accessories (lacking tripod): 17.3 kg (38 pounds). The case has only a top leather-carrying grip for one-person carry. Not two side handles for two person carry as one would expect. I now have much more respect for the muscularity and endurance of the Swedish WWII military foot soldier. The film is flattened by a built-in vacuum pump in the film back. 190 mm double perforated roll film. 200 exposures per cassette. Cabling to DC power supply, airplane circuitry or battery. Separate handheld light meter, not supplied with kit. 1/75, 1/150 and 1/300 second. Little is known about this camera outside of several factory photographs and a short description in Afaltar’s book. There are also photographs and a short summary in Hasselblad Compendium by Nordin, and a poor copy of a factory data sheet (probably one page out of the instruction book). Anyone who chances upon one is urged to record all the details concerning lenses, dimensions, weight and all else that can be determined. Every bit as interesting would be an original or photocopy of the Instruction Manual. Page last updated: november 12, 2008.